Open this book and find out how and why. 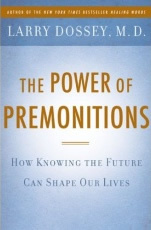 Larry Dossey, the doctor -- and bestselling author -- who first demonstrated the healing effects of prayer, now offers an unprecedented look at the science of premonitions. A dream prompts a mother to remove her baby from his crib an hour before a chandelier falls and smashes it. More than a dozen people are no-shows for choir practice for the first time ever at the moment their church explodes. Before his patients ever call to say they're coming to the hospital, an obgyn gets a pain in his chest signaling they're ready to deliver. Visions of planes crashing into buildings causes a mother to cancel her family's Disney World trip scheduled for 9/11. Are these coincidences, or is something happening that we need to pay attention to? This is the question Dr. Larry Dossey asked himself during his first year of medical practice. He had never had any sense of knowing the future when he experienced a week of premonitions about patients, all of which came true. As a scientist and medical doctor he was taught that knowing the future wasn't possible. He was scared to talk about his premonitions because if he dared believe anything he was experiencing was possible -- that the future could be known before it happened -- then his entire education and worldview would be turned on its head. But as suddenly as the premonitions started, they stopped: "It was as if the universe, having delivered a message," writes Dossey in the introduction, "hung up the phone. It was now my job to make sense of it -- which I try to do in this book." More than an examination of case studies, The Power of Premonitions reveals the world of science and research that proves the human capacity for knowing the future. Experiments consistently show that human beings are as wired to know what's coming next as we are to see, feel, hear, and think. Dossey uses cutting-edge science to prove the value of what has long been considered the provenance of mystic charlatans and to show readers how they can cultivate their natural abilities. This is a book for the skeptical mind, but it's also for the believer's heart -- because its author possesses the rare gift of having both. "I'm not asking you to take anything in this book on blind faith, but to open yourself up to the possibility of premonitions and the evidence supporting them. Listen to the stories people tell. Explore the research that demonstrates our capacity to sense the future. Ponder the implications of mind outside of time. Invite premonitions into your life and see what happens. If you do so humbly and reverently, your life will likely become more premonition-prone, and you may touch that exquisite, infinite realm to which premonitions, now as always, are a door."